Special Containment Procedures: SCP-572 may be safely kept in a locked safe-deposit box at Site 19's High Value Item Storage Facility. Standard positive-action defenses (explosive, chemical, biological, and memetic) are to be in place at all times, according to standard operating procedure. As there is no possible reason for SCP-572 to be used in the field, the item is to be kept more as a curiosity than for any scientific purpose. Description: SCP-572 is a sword of the "███ ███████ ██████" model manufactured by █████ ██████. 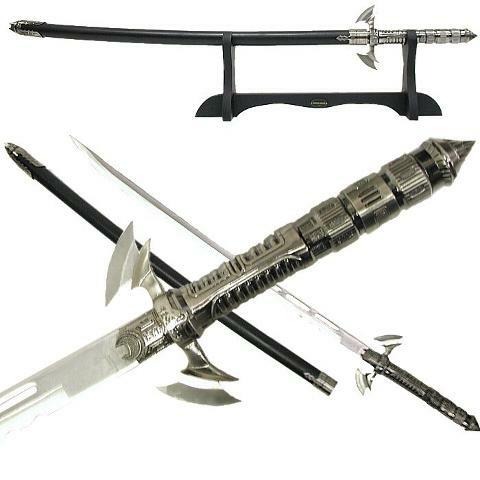 The weapon is badly balanced for combat use, is made of substandard steel, and does not hold an effective combat edge. However, the weapon has the unusual psychotropic quality of convincing any person who holds it of its "balance" and "cutting power", as well as conferring feelings of great strength and invincibility. This effect cannot be countered by any known means, and the affected subject will continue to maintain these beliefs so long as they hold the blade. Subjects will be compelled to perform dangerous stunts using SCP-572, including but not limited to: attempting to cut a moving car in half, slicing through a bullet fired from a rifle, cutting through another sword, and engaging in a live-steel duel with a trained period swordsman. Because of the prevalence of unnecessary cutting edges, 75% of such attempts end with serious injury being inflicted upon the user. Should the sword be successfully wrested away from an affected subject (preferably using long-handled tongs to prevent the retriever being affected), all psychological effects can usually be expunged by a single swift blow to the back of the subject's head. Addendum: SCP-572 was retrieved from the home of a ████ ██████. Upon being apprehended for violent drunken and disorderly behavior, Mr. ███████ attempted to charge the arresting officers while brandishing SCP-572, screaming that he would "take their heads, and with it, their power." As Mr. ███████ was overweight and badly out of shape, officers successfully pacified him using TASERs and flexible baton (beanbag) rounds fired from a 12-gauge shotgun. Upon retrieving the weapon, Officer ███ was heard muttering about the effectiveness of SCP-572, claiming that if Mr. ███████ had managed to score a hit, one of the officers would have lost a limb: this despite the fact that the weapon had an edge blunter than a butter knife. An SCP deep-cover operative assigned to the precinct discovered SCP-572's unusual properties and retrieved it from Evidence Storage. An identical weapon from the original manufacturer was procured as a replacement. As of the writing of this article, no further weapons from the same manufacturer have shown any anomalous properties.